GTAC 2010: Flexible Design? Testable Design? You Don't Have To Choose! Another good talk on testable design, from the Google Test Automation Conference 2010. My LG Neon phone has a feature where it will save all the text messages as a text file on the memory card, however this is not a nice UTF-8 text file, rater one that is almost UTF-16 with reversed byte order, which confuses the local text editors on my Mac. where the data I want is the char bytes. which worked perfectly, and implemented the state machine directly. Now I can save my text messages and have them readable. The basic structure of a shell script state machine is an endless loop with a case branch structure inside that responds to a current state variable. To end the loop "break" out of the while loop. 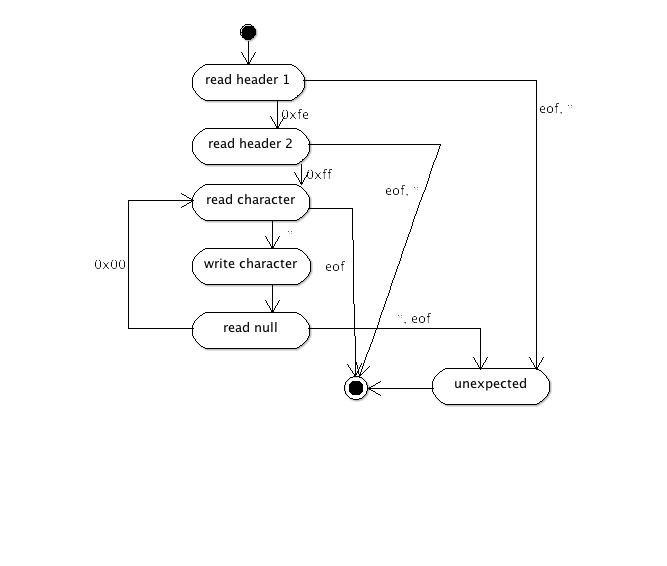 This structure is useful for programs that are easier to express using a flow chart (state chart) than a linear structure, such as an interactive script with retry options. Often I need a temporary directory for a shell script to do work in, one that gets cleaned up even if the script is aborted by the user with CTRL-C. I spent an hour or so figuring out how to make the cleanup happen reliably and now use the following snippet for the task of making and cleaning up the temporary directory.